When the man appeared on Earth, dolphins had been inhabiting the oceans for thousands of years. Naturally, humans began to interact with other creatures in their environment including dolphins, laying the foundations of a relationship that has endured until today but with different forms of interaction. In other words, man’s relationship with dolphins goes far beyond observation and occasional contact. It involves close interactions, associations and even scientific studies that try to unravel the secrets of an animal that has been considered one of the most intelligent in the world. Formerly, relationships with dolphins were in their natural habitat, but now, with technological advances, humans have the power to keep them captive in environments similar to their habitats. However, advanced research always tries to observe animals in the wild as their behavior changes when they are in captivity. Repeated observations proved that dolphins usually approach pregnant women carefully, as they hear the beating of two hearts. The relationships between dolphins and humans can be fascinating, and they can occur both in the wild and in captivity. In the wild, some dolphins have been seen rounding up schools of fish to indicate to the fishermen where to place their nets. There are also amazing stories of dolphins coming to the rescue of divers or boaters that have experienced troubles. In captivity, the continuous interaction between dolphins and humans for training or research or the contact for physical and emotional therapy create strong bonds with the dolphins. It seems that the human connection with dolphins dates back far into ancient times as there are plenty of markings and old artwork that depict these animals. Some civilizations believed to be a spiritual connection between the gods and humans. The frescos of dolphins in the palace of the ancient city of Knossos in Crete give us an idea of ​​the familiarity between this species and the Islanders. Many species of dolphins are now believed to capture their food in association with fishers: they may follow dolphins to catch fish of a particular species, or even dolphins show them where to lay their nets to find some marine animals. Some people claim that dolphins have rescued divers or swimmers who are in trouble by helping them to reach the surface, just as they do with their injured mates. On the Internet, there is a recent video where you can see how a dolphin, trapped in a net, seems to “ask” for help to a Scuba diver to get free. In 2013, a bottlenose dolphin (Tursiops truncatus) was stranded on the coast of Australia and was assisted to return to the sea, but now the dolphin has been seen approaching the swimmers and playing with them. People does not show fear to Dolphins as they have a reputation for being friendly, charming and benevolent with humans. However, there are differences between the dolphins that are in captivity and those in the wild, since their encounters with people are occasional. There are multiple reasons to keep dolphins in captivity, according to humans. 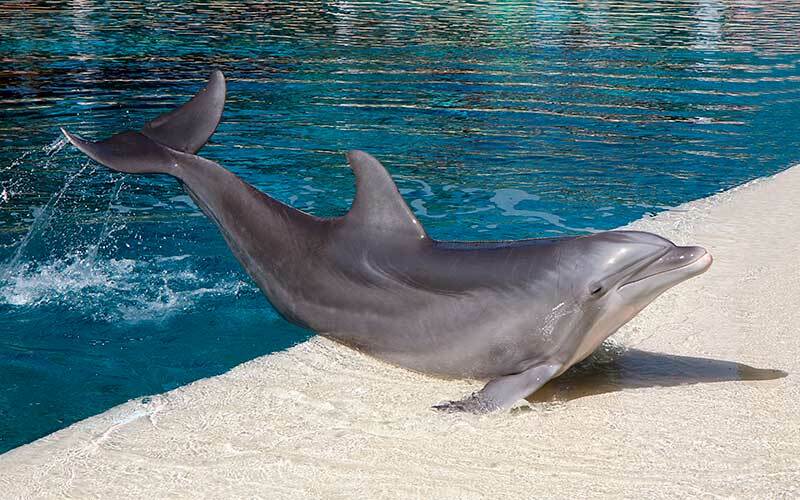 These dolphins live day-to-day with people either in water parks, aquariums, reserves or similar places. At water parks, they are trained to perform several acrobatic tricks that use their natural ability for the enjoyment of an audience that goes to see them in a show or to swim with them. At present, the so-called dolphin-assisted therapy, a type of treatment that uses animals as a therapist for people with some physical or emotional condition, is in vogue, under the argument that the relationship is beneficial for the health improvement of the patient. Other human interactions with dolphins are frequent during the observation or research of populations in the wild or specimens in captivity. These studies, investigations, and experiments that have provided lots of information about the life of dolphins have been carried out in both scenarios with a varying degree of success. Among them, the studies to test their intelligence, performed using simple but ingenious experiments, have excelled. In addition to the above, did you know that dolphins are part of the armed forces? Despite being a questionable activity, it is a fact that some armies train animals for some military purposes such as rescuing injured or trapped people. We should not forget that one of the factors of the popularity of dolphins is due to the numerous times that they have appeared in cinema and television. WHY DOLPHINS DEMONSTRATE GREATER TOLERANCE TO HUMANS THAN OTHER AQUATIC SPECIES? Some people believe that dolphins have a particular predilection for humans given the continually positive interactions between them. They have rarely attacked a person. Instead, they have helped them often. The truth is that there is nothing to indicate that dolphins feel a particular empathy for the man since they have a highly developed social behavior and they behave the same way with other animals. A study from the University of Kyoto (Japan) states that dolphins can see the world and solve problems in a similar way than humans do, so their feelings, so to speak, could also be analogous to that of the human species. The echolocation allows dolphins to know that a human is a living being and to understand when he is in trouble and when he need protection. That is why they usually approach pregnant women carefully since they hear the beating hearts of two persons. We must consider that although not usually aggressive, dolphins are not domesticated animals, and even if they were, they are as unpredictable as any other wild animal. On the other hand, there are some inherent dangers if we do not respect the distance between them and us, because of dolphins, like men, are sensitive and tend to suffer from stress, illness, and other diseases if the human being abuses its power. Even though there is usually nothing but harmony when dolphins and humans interact, that isn’t always the outcome. Dolphins can be very aggressive if feel threatened or stressed or when other members of their pod are in danger. One strange incident was the attack in 2010 at SeaWorld by a dolphin, an orca called Tilikum, killing its trainer, Dawn Brancheau. In 1994, a man in Brazil died when a Bottlenose Dolphin attacked him. Some believe that people continually harassed this dolphin, but nobody knows if it was the case at the time of the incident. Therefore, many experts though do caution people to be aware of what dolphins can do both in the wild and in captivity. Diana Reiss. The Dolphin in the Mirror: Exploring Dolphin Minds and Saving Dolphin Lives. Houghton Mifflin Harcourt, 2011. Karl Erik Fichtelius, Sverre Sjölander. Smarter Than Man? : Intelligence in Whales, Dolphins, and Humans. Pantheon Books, 1972.